Pen Chalet is such a cool online shop. I wish I could give them more love on this blog than I do. But, alas, there are far better fountain pen reviews on other blogs than I could provide, and Pen Chalet is really intended for the fountain pen and finer rollerball market. Wooden pencil blogs lie pretty far outside that market. I did write about this mechanical pencil, but other than that, there isn’t much I can rightfully cover on this blog. Here’s something cool they just started carrying recently — something I’ve been wanting to try for a while. It’s often called a “forever pencil”, though that’s kind of a misnomer. 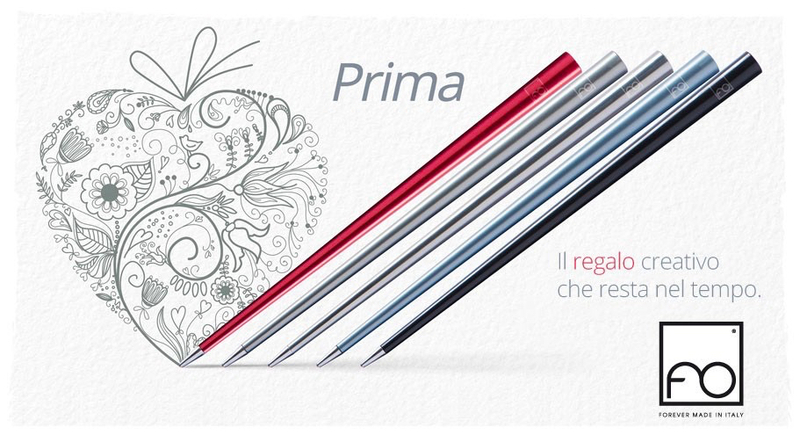 This chopstick-looking thing is called a Prima, made by an Italian company called Napkin. Pen Chalet sells writing utensils in three varieties that writes in a pretty unique way. This is the budget option, at $49. or an oxidation forms on the tip, and rubs off when it makes contact with the paper. 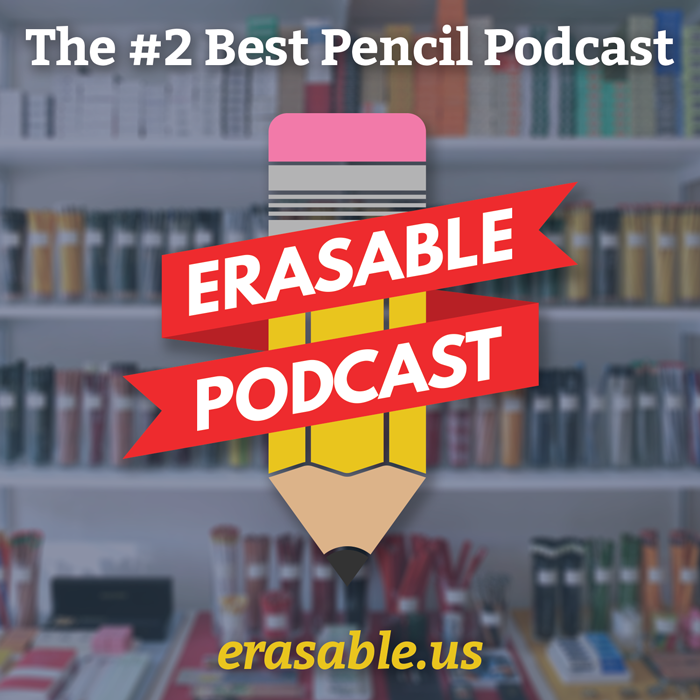 Keith McCleary is a chemist, and a lister of the Erasable Podcast. He’s pretty active in our fantastic Facebook group and when we were discussing how the Napkin products work, he postulated the latter, that the alloy quickly oxidizes and rubs off onto the paper. He thinks the tip could be made from a blend of lead, tin and possibly bismuth, all of which have black oxides. What’s fascinating to me is that, if this is true, it can oxidize fast enough to continuously generate rust to rub off as you’re writing. Keith confirms — that the combination of heat from friction and air can cause that reaction instantly. So is this thing a pencil? Or a pen? I think it’s still up in the air. It doesn’t leave bits of itself behind to write like a pencil, but it also doesn’t distribute a medium that introduces pigment to a surface, like a pen. It causes a chemical reaction that rubs off to make a mark. It’s a science pen! Visually, the Prima is striking. It’s long and skinny, and it gently tapers to a point. The other two products in the Napkin line carried by Pen Chalet are also striking, through in completely different ways. 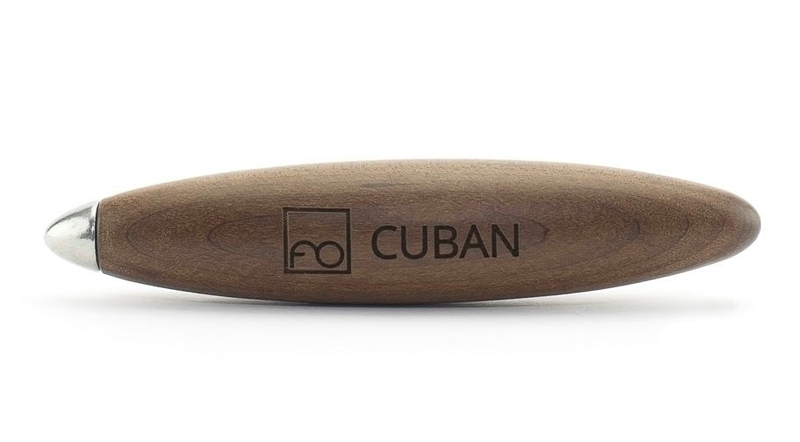 There’s the $59 cigar-shaped Cuban with a round, blunt tip intended for drawing and shading. And, at $119 (more than twice the price of the Prima), the Pininfarina Cambiano is (in my opinion), the handsomest and most ergonomically friendly. Its tip seems to be about the same fineness as the Prima, though I admit I’ve never tried this or the Cuban. The Prima itself comes in aluminum, anodized in seven colors — mine is “Airforce Blue”. It’s just over seven inches long — slightly shorter than an unsharpened Palomino Blackwing — but also much thinner at the writing end than a typical pencil. It’s perhaps too thin to effectively hold and write with. If I could hold it at the opposite end, it would be perfect. Roger Ebert is said to have reviewed movies based on, not what they are, but if they accomplished what they were trying to be. That’s why he gave good reviews to so many bad movies — they weren’t trying to be some seminal works of art. They were just trying to be mindless diversions. And they were. That said, I’m no Roger Ebert, but I do try to emulate review process. Should I compare the Napkin Prima to, say, a Palomino Blackwing, or a nice smooth rollerball pen? Different from all other writing and drawing tools, the mark is achieved by oxidation, due to contact between tip and paper. So the mark left is very particular, it seems like a pencil but it cannot be erased like a pen, and this makes our writing tool unique in the world. So here’s my conundrum: the Napkin products are “unique in the world,” so how do I tell if they’re good or not? For my particular use case, it’s not ideal. It lays down a light mark, lighter than a 3 or 4H pencil, and it’s not smooth to write with, even it is just a metal tip. The tip is slightly sticky and laggy while it slides across the page. After trying it on several kinds of paper, the best kind to use it with is something more toothy than smooth. Think Ampad, rather than Rhodia. After a tip from Chris Rothe, the proprietor of Write Notepads (and a guest on Episode 30 of Erasable), I tried the paper in a Write pad. It was indeed noticeably better than the other papers I’ve tried. Just as toothy paper grabs more graphite than smoother paper, it seems to grab more oxidization from the Prima, leaving a darker mark. 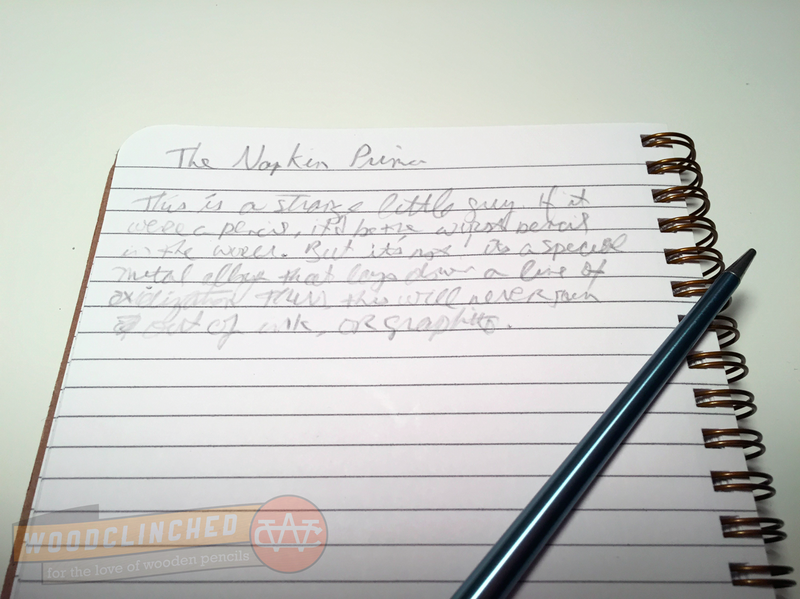 So, what is an ideal use-case for a Napkin product? I’m just not sure. If you love the novelty and the lack of maintainance that this brings — you never need to sharpen it, refill it, or as far as anyone knows, replace it — it’d be perfect for you. You can write and write and write, and you’ll run out of paper before you run out of Prima. But personally, I like being able to switch it up a bit. When my pencil is running out, I can switch to a new one. Same thing with pens, though admittedly I usually lose them before they run dry. Would I buy a Napkin for myself? Probably not. 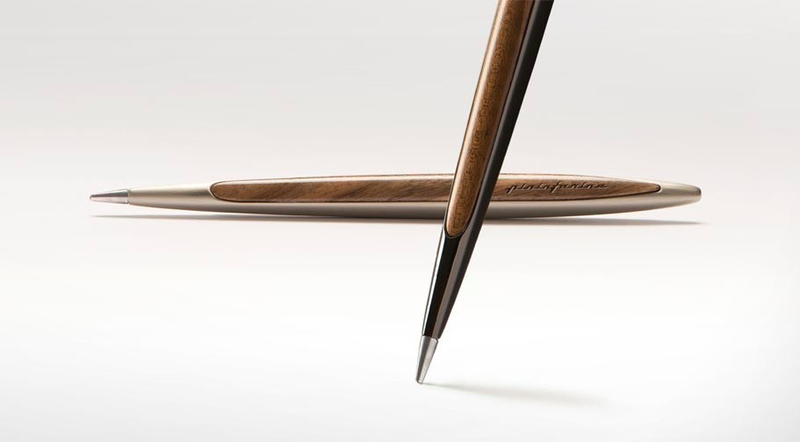 It’s expensive and the performance just doesn’t rival a nice pencil or pen. Am I glad I have one? Absolutely. It was fun to try out, and dang, it beautiful to look at. It’s a novelty for sure, but I’m sure I’ll bring it out to show someone every now and then. If you want to try one for yourself, head over to PenChalet.com and pick one up for $49 here. 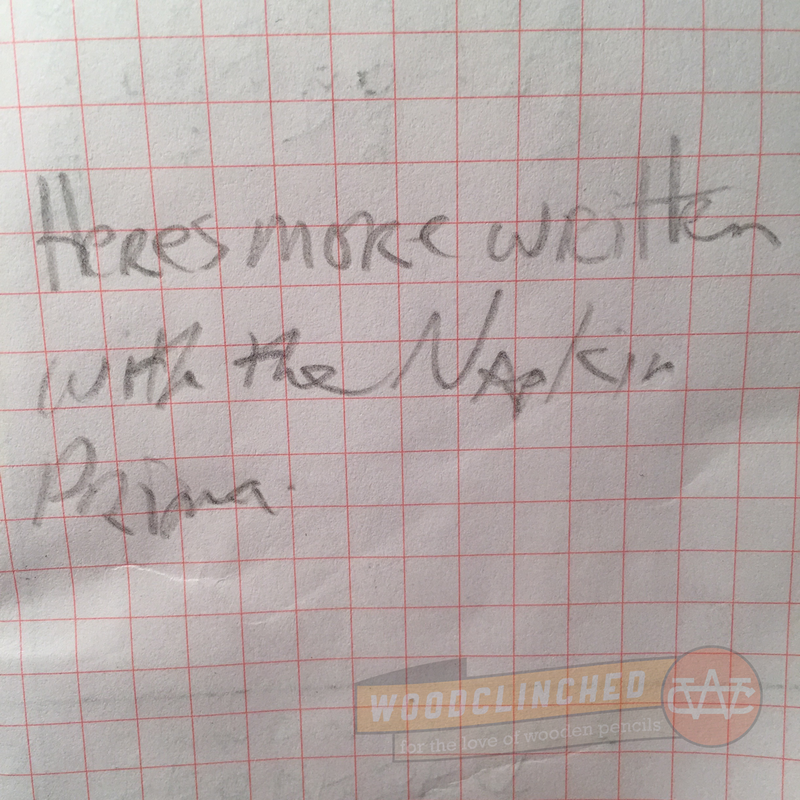 Disclaimer: I acquired the Napkin Prima from Pen Chalet for review purposes, and paid no money for it. Other than the product, I have not received any financial recompense whatsoever from Pen Chalet. Cult Pens keep these and another brand called Axel Weinbrecht Designs. The Napkin ones refer to a tredemarked name for the tip, “Ethergraf” while the others say only that the alloy tip will wear away and can be sharpened with fine sandpaper. Michelangelo and Leonardo both sketched with “silverpoint” – silver wire in a holder, and the Romans used lead styluses. I imagine these new versions last a bit longer. Maybe one day the goose quill will be mainstream again? 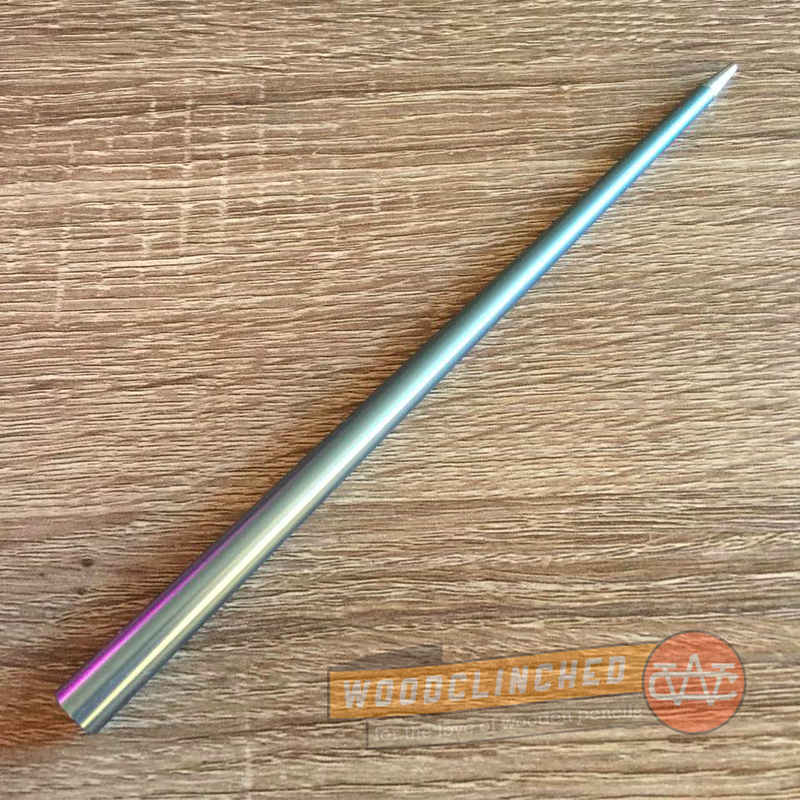 I said as much on the Erasable podcast group, but the “chopstick” shaped versions look like they’d do good duty for ropework, as well as writing, if you don’t have a marlin spike to hand. The “Cuban” is the beginnings of a half decent Groucho Marx impersonator kit. Your penmanship is abominable. For someone who goes on about writing instruments as much as you do, one would think you’d spend some time learning how to use them. I’m a sketch artist and use it to ‘rough out’ drawings… before laying down the ‘bolder’ line work over the top of it. Very nice! Just one question about this kind of “pen”… The mark written with this “pen”, can be erasable? Hey Federico! I don’t believe it is. I’ll double check and let you know here!